Russell Ferrell is a non-fiction, historical writer who was working on several book projects in the historical field when he put them aside to tell the true story of Cephis Hall and Sid Love. The Hall-Love story features their long ordeal and battles in the aftermath of their recovery of a world-class dinosaur specimen in McCurtain County, Oklahoma. 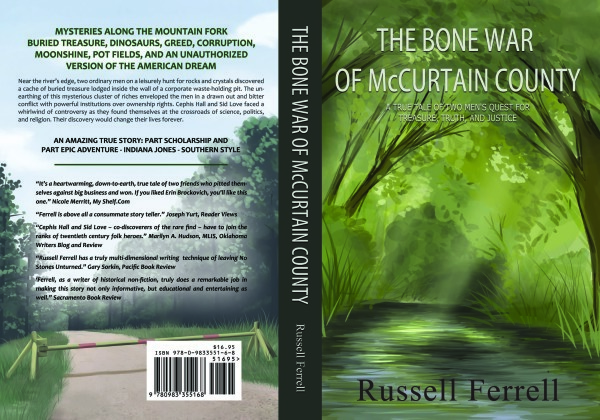 The story is chronicled in Ferrell’s book titled The Bone War of McCurtain County. Ferrell, a graduate of Texas A&M, Commerce, has worked as an educator, journalist, home builder, and cattle rancher. He currently lives in Red Oak, Texas, with his wife Waynetta and their four dogs and three cats. Before moving to Texas, he lived in Atoka County, Oklahoma, where he operated a cattle ranch north of Durant.